Having a Special Event...Wedding, Sweet 16, Anniversary, Corporate Event, or any other Milestone you desire to make even more special. We can make it happen with Fireworks! We first evaluate your site to establish if it can accommodate a Fireworks show. Then we work with you on what a comfortable budget is for you. We then work with the facility and the local officials on all the necessary details (Permits, Insurance, Etc.). We do it all for you! Weddings are a Very Special Event for everyone! This is one of the areas that we specialize in when it comes to us putting on a show. 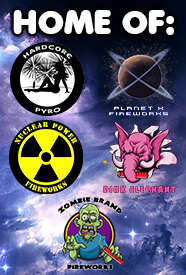 Our High Energy Pyrotechnics Division specializes in putting on Professional Displays. Let us take your Wedding to the next level! Fireworks provide an entertainment value like no other. Your event will be remembered in an extra special way, for years to come! Our team of Professional Pyro technicians can produce an event for you that will Blow You Away! Fireworks are done to “Compliment” your special day, and make it all the more memorable. To enhance your special day, the Fireworks program is usually done in a smaller timeframe. The Fireworks energize your guests and add excitement to your event. This addition is sure to excite you and your guests in a very unique way! We chose effects and colors specifically for a Wedding Program. Reds and Whites are always winners for a Wedding. If you like certain colors, we will use them. Looking for a certain effect, we can do that. Each display is customized for each couple. Fireworks will insure that you and your guests truly remember your event as Fireworks take it to another level! Our Passion for Fireworks will energize your Wedding with even more Passion and Emotion!